In stark contrast to their party’s public stance on Capitol Hill, many Republicans privately acknowledge the scientific consensus that human activity is at least partially responsible for climate change and recognize the need to address the problem. Most say the reluctance to publicly support efforts to address climate change has grown discernibly since the 2010 congressional elections, when Tea Party-backed candidates helped the Republican Party win control of the House, in part by targeting vulnerable Democrats for their support of legislation establishing a national emissions cap-and-trade system. Ah, Brave Sir Robin GOP! …the devastating impacts of the economic crisis, the low priority Americans place on addressing climate change and what Republicans say is overheated rhetoric from Democrats. Also playing a role in the reluctance to speak out is skepticism among Republican voters about federal government intervention and the increasing role of special interest money in elections. That last one is sweet, isn’t it — that nasty “special interest” money. I believe that special interest is spelled K.O.C.H. et al., but never mind. And as for overheated rhetoric — well, I’m gearing up to do some separate posts about how all the climate news lately is worse than we thought, so for now, let me just leave you with this reminder of how badly, f**ked we may already be. Yes, if only Barack Obama would stop presidenting while Black/Democrat, the Republican Party would leap into the breach. [NRDC Action Fund spokesman David] Goldston said the Tea Party movement has swept many more deniers of climate change into Congress than ever before, and it has pushed Republicans away from basic environmental principles. He disagreed with others who said many Republicans privately acknowledge the risks of climate change, even if they don’t say so publicly. Read the whole thing. Adragna tries to present the notion that Republicans as a party, as opposed to a handful of dissidents, actually do take this most serious of issues at all seriously. He lets his sources make their best case…and the take-away is of a party that is in the hands of anti-science crackpots whom those who do know better are powerless to control Which seems about right. he [does] not believe in human-caused climate change. “For everybody who thinks [the planet] is warming, I can find somebody who thinks it isn’t,” McConnell told the newspaper. I say “shut your festering gob” you hopeless git. For everyone who says you are any kind of a public servant, I can find someone who swears you enjoy the carnal knowledge of barnyard animals. 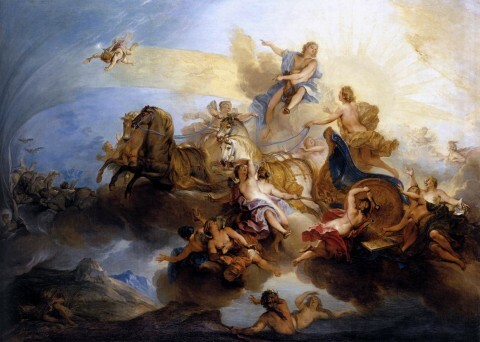 Image: Nicholas Bertin, Phaéton on the Chariot of Apollo, c. 1720. …is looking to be an even worse investment than legend would have it. Parts of the UK and the US state of Florida were already facing “a risk environment that is uninsurable”, said the global insurance industry trade body, the Geneva Association. The interplay between the potential of rising risk levels and insurance demand, but decreasing self-protection, could create a risk environment that is uninsurable in some regions (Herweijer et al., 2009). Examples for markets with this potential are U.K. flood or Florida wind storm insurance. So, to sum up: those with actual money on the line agree that (a) global warming is real; (b) that significant human and environmental consequences are already in train; and that the way we live now — especially on the coasts — is not sustainable. So, GOP, et al. Here’s the deal: Don’t ask if you believe in climate change. Wonder instead, does climate change believe in you? *This passage in the report goes on to say that “There is broad agreement among experts that this global trend in economic as well as insured losses from natural disasters is primarily driven by socio-economic factors…” Translated, that seems to be making the argument I’ve heard (and advanced) since working on my book on climate change way back in the late 1980s. That is: there are natural events (like a hurricane) and human disasters, the losses incurred by what natural events do to the physical infrastructure and populations we’ve built up in the path of extreme natural processes. Simpler: the cost and risk of climate change comes not simply from stronger or more frequent storms (or whatever) but because we’ve got so much more to lose along, say, the Florida coast than we did 50 or even 10 years ago. Image: J. W. M. Turner, Snowstorm off the Harbor Entrance, 1842. Over in Australia, where the plague of special interest enmeshed AGW “truthers” has been just as bad, if not worse than the miserable corps we have here,* an impressive cross section of the Oz scientific community is actually making some noise. The overwhelming scientific evidence tells us that human greenhouse gas emissions are resulting in climate changes that cannot be explained by natural causes. Climate change is real, we are causing it, and it is happening right now. Bam! Short, simple, clear and true. …Understandable economic insecurity and fear of radical change have been exploited by ideologues and vested interests to whip up ill-informed, populist rage, and climate scientists have become the punching bag of shock jocks and tabloid scribes. Aided by a pervasive media culture that often considers peer-reviewed scientific evidence to be in need of “balance” by internet bloggers, this has enabled so-called “sceptics” to find a captive audience while largely escaping scrutiny. Australians have been exposed to a phony public debate which is not remotely reflected in the scientific literature and community of experts. For the next two weeks, our series of daily analyses will show how they can side-step the scientific literature and how they subvert normal peer review. They invariably ignore clear refutations of their arguments and continue to promote demonstrably false critiques. We will show that “sceptics” often show little regard for truth and the critical procedures of the ethical conduct of science on which real skepticism is based. And they’ve begun. You can check out the series here. Now, while I was born at night, it wasn’t last night, so I know that even sharply argued rational discourse won’t make a difference to the professional skeptics. They’re in it for the money, and for the warm and fuzzies that come with comforting the comfortable. The real targets of this kind of effort are the media, and through them, the mushy middle currently being persuaded by false information disseminated within a fake debate. Anne Laurie wrote yesterday on the problem with that ambition: that too many, in the US at least, have now crossed the line into territory where belief in the great secular-scientific conspiracy on AGW has entered the realm of religious commitment, of identity. That’s territory in which argument has little or no pull; once it becomes a condition of one’s world view to affirm something false…counterarguments aren’t even heard. She (and Tom Junod, who wrote the inciting essay at Esquire) may well be right. But the triumph of (bad) faith over works in this field is recent, and not yet universal. The long road back begins with both hard fact and sound reasoning, relayed over and over again — and the repetition, just as loud, just as often, of the counter meme, that those lying about global warming are doing so to line their own and their patrons pockets. “Follow the money” ain’t dignified (or original). But everyone, including true believers, understand what it means. So, good on ya, my Aussie kin. Let’s have more of this, and over here. 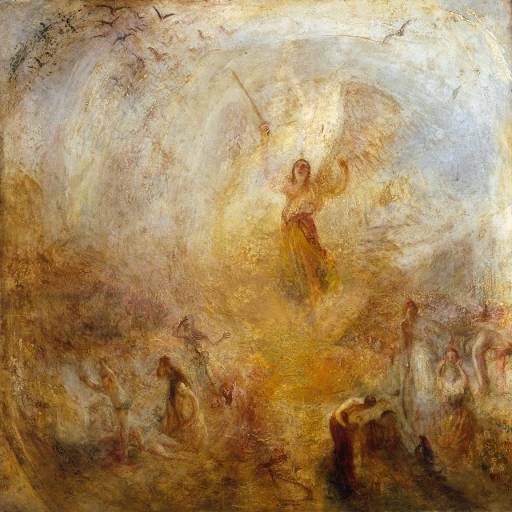 Image: J. M. W. Turner, The Angel, Standing in the Sun, 1846.